Edit your widgets worry-free with Automatic Widget Backup. With only a few clicks, you can add, update, move, and delete WordPress widgets on your website. WordPress makes it very easy to manage widgets of all types, and their content sometimes play an important role. In fact, this is so easy that it’s hard to avoid small mistakes, such as deleting an important widget on a live site. Because WordPress does not keep backups of sidebars and widgets, that simple mistake means bad news. Unrecoverable widgets is a bigger problem than you’d think, but it doesn’t need to be. With Content Aware Sidebars Pro, the widget areas you create will be secured with automatic backups everytime a widget is added, updated, or deleted. And this works for any widget! So whether you accidentally remove crucial content in a widget or delete the widget alltogether, we got you covered. And because the backups are automatic, you don’t need to hassle with manual file uploads. Simply click and restore the sidebar widget as it was. 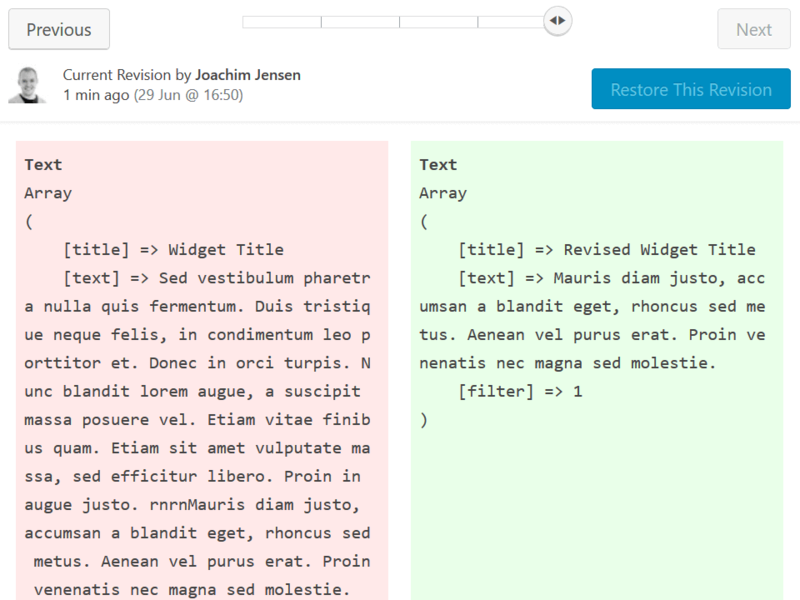 Not only does Content Aware Sidebars Pro save backups, it also adds a timeline of all widget revisions. You can compare the actual widget options side-by-side to see the different changes. Easily backup and restore any WordPress widget on your website.